Earn $214.95 in Rewards credit. Click to learn more. 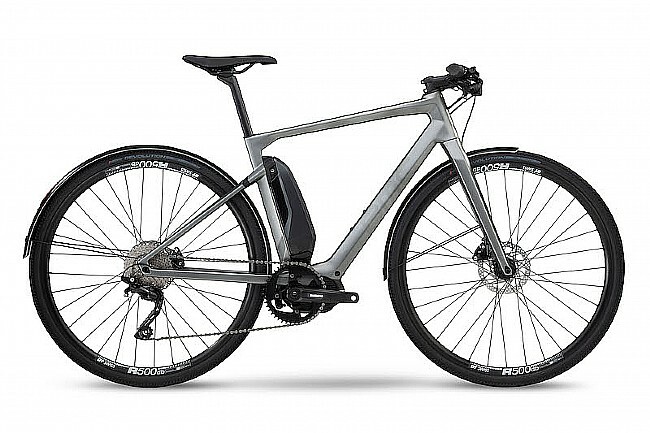 BMC's 2019 Alpenchallenge AMP City ONE E-Bike is designed for those who seek both unique style and urban functionality. Micro Travel technology combined with a lightweight carbon fiber frame delivers a smooth and comfortable ride experience. Frame: Alpenchallenge AMP Premium Carbon, Micro Travel Technology, Flat Mount. Motor: Shimano STEPS E-6100 250W, 60Nm output. Battery: Shimano STEPS BT-E8010 504Wh. Shifters: Shimano Deore Trekking, Shimano SW-EW6010. Rear Derailleur: Shimano Deore Trekking. Brakes: Shimano UR300, SM-RT26 Rotors 160mm. Saddle: Selle Royal 2058 DRN. Seatpost: Alpenchallenge AMP "D" Premium Carbon, 15mm offset. Hubs: Formula, Thru Axle, 12mm (front & rear). Tires: Vittoria Revolution Tech, 35mm. Manufacturer Warranty: frame - 3 years; paint - 2 years.